Amish use banks often to handle everything from making deposits to taking out business loans and mortgages. Amish often live in close proximity to small towns, giving them access to local bank branches. Amish will typically maintain checking and savings accounts, and use banks just as any other Americans do. 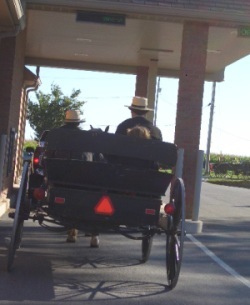 Amish typically patronize smaller, local banks. Home Towne Heritage bank is an institution popular among Amish in Lancaster County, with a high percentage of Amish clientele. Home Towne Heritage was started with the help, in part, of Amish founders. Amish enjoy a good reputation when it comes to financial matters. An employee at a local Lancaster County bank commended Amish customers for never being delinquent on payments. Amish are generally regarded as reliable bets when it comes to making loans, whether for personal or business purposes. A loan officer in an Amish community commented that “in the last 10 years, we never had any of our Amish clients go into foreclosure, nor have we had to force a sale” (“Enterprise Success in Amish Communities”, Kraybill/Nolt/Wesner). Amish themselves do provide capital for loans within the community in some cases, but continue to rely in large part on commercial banks. Amish typically use checking accounts to make many transactions. Some Amish will use credit cards as well. Amish appreciate the convenience and security of banks and make wide use of them. 4 responses to Do Amish use banks? Very interesting, I did not know that……. Do the Schwartzentrubers (the most conservative branch of the Amish) use banks? Or is it only Old Order and above? Yes, my parents used a checking account. I remember when I was a teen, and Dad got paralyzed, and Mom and i went to the bank to cash the 15,000 dollar insurance check. It was not enough. Amish also use Everence FCU, which used to be Mennonite Financial FCU, started by some employees of Scotsdale (Herald) Press. Leave a reply to Do Amish use banks?